Home / Creativity / Why Soap Classes are Fun! OK I just got off track before I just wrote my first sentence! I guess at 6AM I need a bit more coffee before I start writing. 🙂 I was just on Facebook and noticed a name that seemed familiar on a Soap Group I belonged to an realized she is the author of two soapmaking books I own. I had a Soapmaking 101 Class that I taught yesterday after the show I had on Saturday, so it was a busy weekend for sure! I got up early yesterday and primped up my house somewhat and did the dust bunny roundup! Got out ALL my supplies from oils and butters to lye and essential oils and clays and herbs and herbal powders. Put together my handout booklets and made the soap molds my students would be using to put their soaps in to take home. I laid out all the soapmaking books I have collected over the years and realized I still have not quite read all of them. I had two students yesterday which was a small class but enough for some fun. I started out by talking about how I came to be making soap and then asked them what brought them here. Then the magic started to happen as they talked about their love of handmade soaps and then they’re wanting to make soap for themselves and for gifts or maybe something to do after work. They found great camaraderie among themselves and were all excited about learning how to make soap. We talked about the safety procedures to using sodium hydroxide~ lye and various ingredients they could use and other topics. I did a short demo and then the fun began as they helped each other weigh out their ingredients and get familiar with using a scale. Then they chose from a bunch of different essential oils what sort of fragrance they wanted for their soap. And then we looked at colors and how they wanted their soap to look like. It was so awesome to see that enthusiasm just blossom especially as they were mixing their soap up and adding their fragrance and then coloring their batch. The magic happened in the creating and then sharing it with the each other. I love what happens with every class I teach! 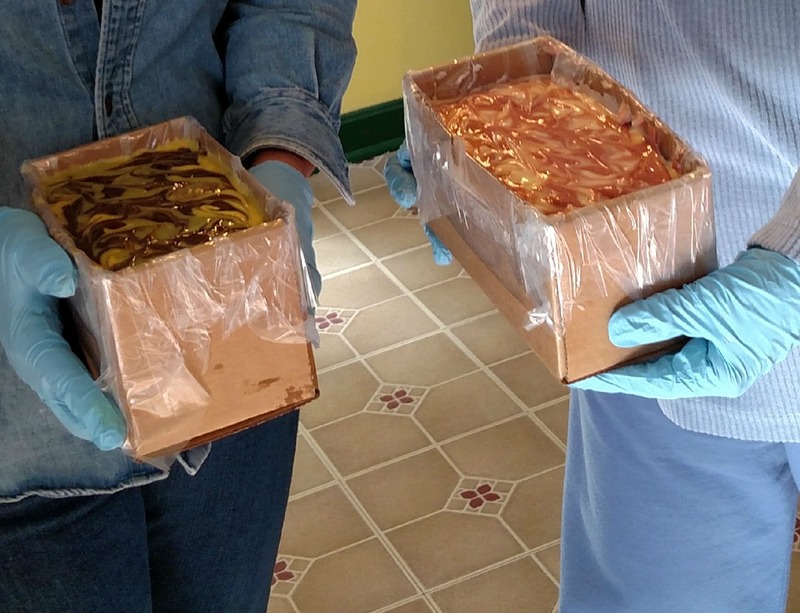 All feel such pride in what they have made and accomplished with their first batch of soap! So when are you coming over to learn? That sounds like a lot of fun. I’ve only made melt and pour soap. I taught it to 2 Girl Scouts once. They wanted their soap to be very sparkly as you can imagine. We had a good time and they were very proud of themselves. It was and is allot of fun. I love the enthusiasm and the pride at learning something so new! I am coming over soon. Looking into moving a previous engagement from my schedule that conflicts with the day of your class. Looking forward to it. YEA! Hope you can make it-please let me know ASAP if it would be just yourself or you and your friend. Have 3 peeps signed up and a fourth maybe.